Electro-pneumatic positioner is used for controlling movement of final control element such as Linear Cylinder, Diaphragm Control valve or Rotary actuator device which accepts directly variable electronic signal & our Electro-pneumatic positioner is a precision device, with the help of auxiliary high pressure supply accurately controls movement of final control element corresponding to set point. 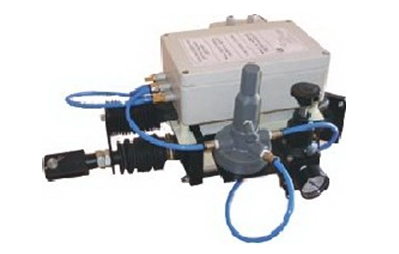 • Our Electro-pneumatic positioner is a Common unit for all type of actuators. Standard product is available in MS powder coated housing suitable for panel mounting with solenoid provided in separate weather proof housing & linear pot for field mounting. However optional for field mounting with built in solenoid with die cast Aluminium weather proof housing can be provided at extra cost. Our Electro pneumatic positioner is a microprocessor based instrument, amplifier of the positioner receives variable input control signal & potentiometer output feedback signal. Microprocessor compares these values & depending upon vectorial difference decides & fires the corresponding relay which in turn triggers solenoid to admit & exhaust air from actuator. The system is based on modulation of signal & its time function. The microprocessor precisely calculates the time function & accurately positions. The movement of actuator standard instrument available with input control signal of 4-20 MA. However the system can be modified for accepting other variable depending upon specific requirement. Similarly normal characteristic is linear, however optionally other characteristics such as equal percentage or square-root extraction is also available.